Five Greenpeace activists last week entered the security zone of the Kori Nuclear Power Plant. Arriving via a black inflatable boat, they climbed out and scampered up a rocky slope, unfurling a bright yellow banner in front of the plant’s fence. For 40 minutes they stood their ground as guards looked on, sirens blazed, and warnings from the Coast Guard were broadcast over the loud speaker. 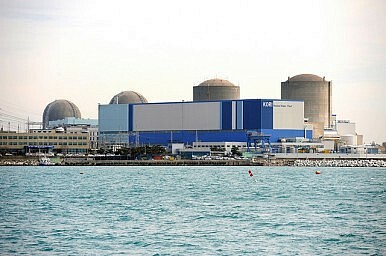 In South Korea, the world’s fourth largest producer of nuclear power, the government is planning to expand the Kori site. With six reactors online, two waiting for operating license approval, and an additional two planned, it will bring the total number to ten reactors by 2022. Yet with 3.4 million people living within the 30 km zone, major companies such as Hyundai Motors located nearby, and popular Haeundae beach also in the vicinity, it reveals a government in denial of the threat to its people and nation. But for the government and the industry, the argument is that Korea needs nuclear power. But the reality is that industrial economies, both established and rapidly developing nations, are investing in renewables because they are reliable, affordable, quick to install, safe, and are the best generating technology to reduce carbon emissions. In 2014, Germany, Japan, China, India, Spain, Mexico, Brazil and the Netherlands collectively generated more electricity from renewables (excluding large-scale hydro) than from nuclear power. Even before the tragic Fukushima Daiichi nuclear accident in 2011, the global nuclear industry was in decline. Its peak was in 1996, when 17.6 percent of the world’s electricity output was generated by nuclear reactors. By 2014, this had dropped to 10.8 percent. In contrast, renewable energy growth in the last 15 years has been stratospheric. Last year, 49 percent of the global investment in new energy sources was in renewables – principally solar and wind. Even in the few countries where significant nuclear power expansion is taking place, such as China, renewables are far more important to their energy future. China invested $8 billion in nuclear power plant construction in 2014, compared to more than $83 billion in non-hydro renewable energy. Yet the Korean government has just announced its “new” energy plan for 2029, which sees an additional eight new nuclear reactors in addition to the four under construction, while committing to expanding renewable energy from the current base of 4.5 percent of electricity to 11.7 percent by 2029. Current Korean energy policy is clearly out of touch with global trends, based as it is on 20th century technology. Greenpeace Japan’s investigation in Iitate, Fukushima prefecture, in June and July 2015 found that levels of radiation 35-40 km from the devastated nuclear plant remain high, with dose levels many times above what would be possible for people to live without risk. The efforts of thousands of workers to decontaminate areas of north-western Fukushima are not working, while the cost to date of the accident exceeds $100 billion. Today, tens of thousands of Fukushima citizens remain displaced from their homes, and as a result of a decision by the government of Shinzo Abe are being given an impossible choice – return to their homes, otherwise compensation payments for emergency housing will be terminated by 2018. The meltdown of three nuclear reactors at Fukushima dramatically exposed the reality that multiple reactors at a nuclear power plant site equal catastrophic failure. The warning to then Prime Minister Kan given by Japan Atomic Energy Commission on March 25, 2011 was that under the worst case scenario it may be necessary to evacuate the population out to 170 km from Fukushima, and even as far as 250 km. What could have been fortunately was avoided, but it was this scenario that helped convince Kan that a technology that could force the evacuation of over 50 million people, and effectively destroy a nation is too dangerous to have any future in the country’s energy program. It is a view shared by the majority of Japanese. More than four years later, two nuclear reactors out of the remaining 43 have resumed operations. The future for the others, which remain shut down, remains highly uncertain with people across the nation campaigning to stop their restart. The majority of South Korean people, like the people of Japan, have understood the lessons of Fukushima – that nuclear power is a technology with unacceptable risks. In contrast, both the Abe government in Japan and the administration of Park Geun-hye in South Korea are deliberately ignoring the lessons of Fukushima. It took the Fukushima Daiichi accident to change the mind of one national leader. South Korea should not have to wait for an accident at Kori to have a similar effect. Daul Jang is the Project Leader for the Climate and Energy Campaign at Greenpeace East Asia in Seoul. Can Red China Really Be the World’s New Green Leader? In the absence of U.S. leadership, Beijing’s policies on climate change are likely to set the global agenda. Learning From South Korea's Energy BreakthroughWhy Is Asia Returning to Coal?Asia-Pacific: Time for New Energy SolutionsPowering Asia’s Renewable RevolutionCould India and China Grow Without Coal?